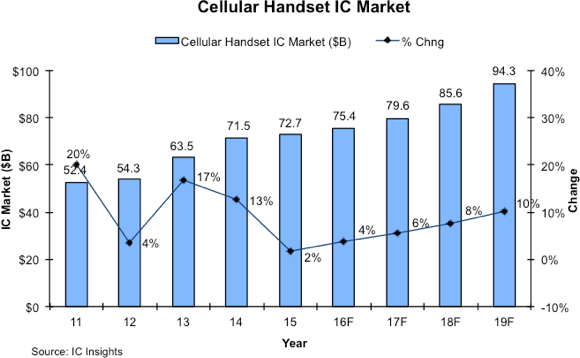 he increasing value of the average IC content in cellular handsets along with the increasing percentage of smartphones sold as a percent of total cellular handsets will help drive the cellphone IC market to $94.3 billion in 2019. Strong double-digit growth rates in the cellular handset IC market were logged in 2013 and 2014 but only a 2% increase was registered in 2015. Despite the expected increase of 4% in 2016, the 2015-2019 total cellphone IC market CAGR is forecast to be 6.7%, 3.0 points higher than the 3.7% CAGR forecast for the total IC market during this same time. The $94.3 billion 2019 cellphone IC market is forecast to be about 30% higher than the level registered in 2015. Additional details on the market for cellular phones and cellphone ICs are included in the 2016 Update of IC Insights’ IC Market Drivers—A Study of Emerging and Major End-Use Applications Fueling Demand for Integrated Circuits. This report examines the largest, existing system opportunities for ICs and evaluates the potential for new applications that are expected to help fuel the market for ICs through the end of this decade.